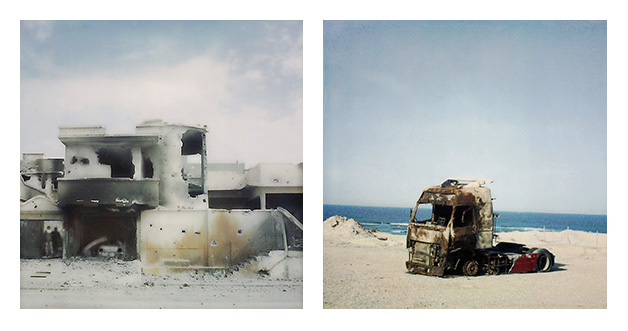 The idea of the project is to place the events of the war in Libya into an alternative visual context, in which the events of the Arab Spring appear not as raw material for reports but as signs going beyond the current and topical. Ever since correspondents have started reporting from war zones with the instruments of photography, the changes caused by armed conflicts in the affected environment, architecture and landscape – depending on the history and nature of the society concerned – have become less visible. The series is aimed to show these changes without having a horrific effect. The images help to understand the nature of the war and to show that the whole terrible process of the war is able to produce “beautiful” installations. This can be achieved by showing the marks left behind by the clashes and the environmental elements, as a kind of setting, to highlight the silence between what has already happened and between the coming of an uncertain future. A tense structure and the choice of the suitable technique and raw material are important components of the presentation. The present time is being shown as an aftermath, in which the traces of war emphasize its lack of humanity and evoke a common sorrow that we are able to share with the people who lived there. The series is supposed to be a lyrical narrative about destruction without the brutality of its documentation, and being able to concentrate on something of greater importance. The series consists of 20 images of an old Polaroid Sx-70 and Polaroid 600, which responded to the various impacts of desert weather in a peculiar way. Its relative dullness and the grain of the film lends a sort of an intimacy to the pictures which he felt was definitely necessary to preserve since the pictures were taken in an environment where the wounds of soul were still bleeding.